Every time we have one of the tragedies this country has experienced today we hear that it is too early to talk about guns. This means that talking about guns will never happen. We will be terrified by the NRA that our liberties will be taken away from us. Who lost their liberties in Newtown, Connecticut? Children—twenty children and six of their teachers—lost everything in less than ten minutes. So we do not need to give up the right to life, the ultimate liberty, and the pursuit of happiness, the ultimate right, I am willing to give up my right to own a gun that shoots out hundreds of bullets in an instant. So children can safely go to school, so shoppers can buy Christmas gifts at a mall, and so fans can watch a movie without fear, I am willing to give up my right to own a gun intended for killing other people only. The joyful, positive, and strong beginning starts me off on a good day whenever I read and recite this canticle. During the time of my work as a hospice chaplain, I recited it often to the hospice patients I visited. The message of fearless living, hopefully, provided strength to those who were in their final days and hours. Among the great things God had done for them was to give them a loving family and friends and the great thing God had done for us was to give us the love and friendship by their being. In the depth of sadness there can be joy and even in joy there can be sadness. “Surely it is God who saves me”, is a strong statement of faith. The Letter to the Philippian Church is Paul’s happiest piece of correspondence. It was the first of the congregations he established in Europe. The city of Philippi was in Greek Macedonia and was a Roman colonial outpost. Apparently, right from the beginning of his work there, he had few difficulties with the congregation. It was mostly made of people with sound faith and trust in the message of Jesus Christ. Further, they lived their faith in such a manner that no on would misunderstand the Christian message. So, as he comes to the conclusion of his letter to them, he tells them to sing out in praise of God and live in the joy of being God’s people in Jesus Christ. What I like more than anything in this letter to Philippians is his instruction to the people to focus on the positive—focus on the good, the worthy, the excellent, the beautiful, and anything that is good—paying more attention to those things then to sit and stew in worry and discontent. That to me is the Christian message. No sour faces, no unhappy words, no doubt about your callings to be Christ’s own forever. Rejoice, he says, and then he tells them to keep on rejoicing. The celebration of the Nativity of Jesus should be a time of great joy. This year, however, joy seems hard to express. As Christmas nears, ask the question, “What are we celebrating?” If we watch the ads on TV and pour over the catalogs that clog our mailboxes, you would think that we are celebrating conspicuous consumption. The problem with conspicuous consumption is that it really does not make us happy. Things often tear at our joy. Things require attention; attention that takes us away from the more important things in life. Owning a lot of things is not a joy. Often I feel oppressed by the things I own. The only problem is that some of those things have become indispensable; like my computers. I now own three and an equal number of printers. One or two are obsolete, and I have no idea what to do with them. I have become like the Ancient Mariner who made a terrible misstep of killing the albatross and then was stuck with it around his neck (it’s a very good poem to read and think about). Well, maybe I am being a little too romantic here—that is, I am using poetic license too much. Nevertheless, we do let things own us with the result that we fail to rejoice when all we wanted we get. My main concern about Christian people is this: many of them are unhappy. You may ask, “How can I say that?” Look around. So many are busy telling other people what to do and condemning people of sins real or imagined. They postpone their joy for a time to come—heaven. They try to sing happy songs but end up either cutting them short or opting for mindless ecstasy. Jesus and Paul lived in a real world. It was a world of evil and ugliness. In fact, it was a far more difficult time to be alive than it is for us today. Nevertheless, they rejoiced in God. They rejoiced that the lives they were living were secure in the knowledge that they mattered and counted with God. Neither of them (Jesus or Paul) postponed their sense of joy in the world. So, as we face the coming of another year of possible tragedy involving our young people what are we to do? We need to take Paul’s advice. Now to capture our sense of joy we need to securely hold tight to the promise of Isaiah when he wrote, “Surely it is God who saves me.” Christians, as you recite those remember that you live as people who have been called the Community of the Saved and that is reason enough to be joyful. 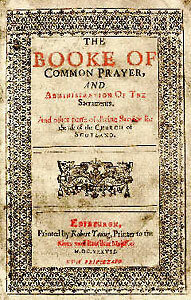 Book of Common Prayer, the First Song of Isaiah Ecce Deus, Isaiah 12:2-6, Page 86.